280g Jar. Contains apples, onions, red peppers, rhubarb, dates, sugar, spiced vinegar(BARLEY), ale (2%)(BARLEY and WHEAT), garlic, MUSTARD seeds, salt, spices. Total fruit and vegetable content 62%. Sweet chilli condiment. 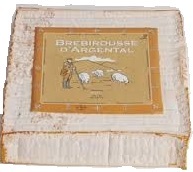 Great with pork pies, Sunday roast, Cold meats and pies. Anything really!! 340g jar. A best seller in store. Mildly spiced fruity chutney. Great with pork pies. 280g jar. 280g Jar. Contains sugar, apples, carrots, swede, onions, water, tomato puree, acetic acid, maize starch, salt, MUSTARD flour, spices, colour : caramel. Total fruit and vegetable content 70%. Total fruit and vegetable content 25%. Great on burgers and sausages from the barbeque or with cold meats and pies. 280g jar. Contains onion, sugar, spiced vinegar(BARLEY), water, red pepper, raisins, tomatoes, modified maize starch, MUSTARD seeds, salt, ginger and chilli. 280g Jar of a classic recipe Piccalilli. Ingredients: Cauliflower, apple, onion, gherkin, silverskin onions, sugar, modified maize starch, lemon juice, salt, MUSTARD, spices. 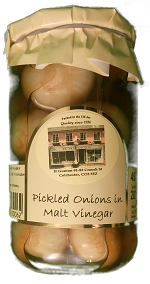 Great crunchy onions in mildly spiced malt vinegar. 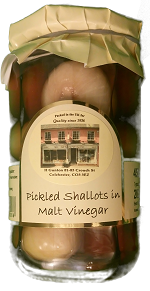 Great crunchy shallots in mildly spiced malt vinegar. 450g jar. 280g jar. Mixed fruit and vegetable Chutney. Contains sugar, carrot, swede, spiced vinegar(BARLEY), apple, onions, tomato puree, salt, MUSTARD, spices.